Climate change activists simply cannot seem to handle even a joke which contradicts their obsession, without getting riled about it and providing long boring monologues about why they disagree with whatever was said. I think this shift toward accepting climate change science could be part of a slowly shifting trend (very slow). Since Anthony Watts handed the reins (temporarily) to "Charles the Moderator" there have been fewer scoffing headlines, at least over copies and pastes of press releases from scientific publications. I haven't been watching as closely over the past few months, but I don't think the science-denying Charles Rotter has used the word "Claim" in any headline and he's not tended to add foolish editorial mockery in the way Anthony Watts does. That's not to say WUWT is no longer a blog for dimwit deniers. It is. It's just that as weather becomes more extreme from global warming the wind is being knocked from WUWT's sails. It's been moving away from climate and more into Trumpian politics, in true right wing authoritarian style. Hunter Cutting tweeted a cartoon for Donald Trump. All the flat earthers and climate conspiracy nutters at WUWT will find the ruler just as useful, no doubt. The reason Eric might have assumed that Donald Trump must have been joking is because Eric lives in Australia, albeit in an area with a very mild year-round climate. Here we're in the midst of another Angry Summer, where back-to-back heat waves have been rolling across the continent since December. If Donald came to Australia he'd not only be hit with a wave of heat from the weather, he'd be hit with a wave of opprobrium from Australians, most of whom regard him as a horrible joke and a danger to the world. Figure 1 | Last 30 days of maximum temperature across Australia, to 19 January 2019. Source: Bureau of Meteorology. 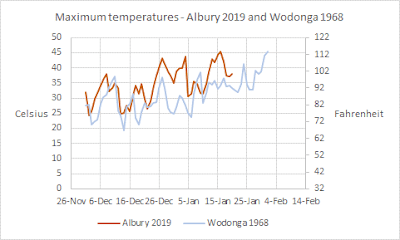 The closest city to where we live is Albury, which has not had a day colder than 30.5 C (87 F) this month, where the average so far is a searing 38 C (100.4 F), and where the hottest maximum was a record-breaking 45.3 C (113.5 F). I've archived the recent readings here. We are used to warm summers but not this warm. Now we're having to get used to very hot summers. The Bureau has issued an interim statement on this current spate of heat waves, which highlights the difficult summer many of us are dealing with. If a USA denier doesn't want to be shoveling snow this winter, you can always come here for a hot break. Just make sure you stay indoors with a decent air-conditioner and avoid going outside. Oh, and you'll be taking your chances with getting in and out of airports in the USA, with your idol doing his best to shut down the country. Addendum: How hot was it in 1968? We'll leave aside the fact that it's not proper to directly equate readings at different sites and take a look at how the two locations compared in December and January. As you can see, this year the heat wave has been worse than it was back then. All of you who live in the region, you're not imagining things! 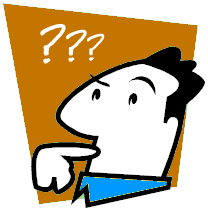 As you know, deniers have a greater tendency to confirmation bias than do normal people. Many of the comments illustrate this, with a number of people missing the point Eric was making, that Donald Trump really does accept global warming science. A few others agree with Eric's portrayal that their idol Donald was joking and that unlike them he doesn't really subscribe to the conspiracy theory that climate change is a hoax. 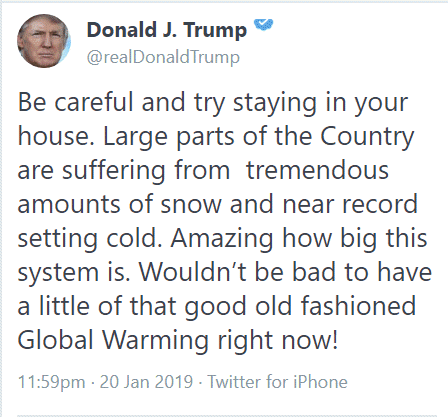 Donald Kasper promotes some weird idea that climate change means there shouldn't be any more snow in winter in the USA. I'd guess he got that strange notion from reading climate conspiracies at WUWT instead of science. Yes it does. When you predict warming resulting in the end of snow and there is record, continent-wide snow, your prediction is invalidated. Climate as usual in the face of predictions of doom does not invalidate the climate. Climate Change activists share many characteristics with Leftists, one being the utter absence of a sense of humour. Good on you Pres. Trump. Keep the sarc. against those nutty Greens going. It looks as if JEHILL doesn't agree with Eric, and instead believes that Donald Trump really is a climate conspiracy theorist like he is. Or maybe it's a case of confirmation bias, and JEHILL thinks that Eric was claiming that Donald Trump wasn't making a joke. The tremendously great thing is they cannot shut his speech down like they do with so many others. Such great political popcorn and they deserve to have their so-called science (computer models e.g. video games) rubbed in their faces. And if the planet was really as warm as it has been in the past we would not have an entire continent under a couple miles of ice but that may be more of location, location, location. I love Donald John Trump, and, despite the fact that I’m a furloughed federal employee, I’m not ashamed or afraid to say it! "The closest city to where we live is Albury, .. and where the hottest maximum was a record-breaking 45.3 C (113.5 F)"
"Albury, on the Victorian border, hit 45.3C on Thursday — its highest temperature on record." The Albury weather station only goes back to 1993. Wodonga is part of Albury and it had a temperature of 45.4C on 1 Feb 1968. That's a very good point, George. You've prompted me to add something to the article showing the difference between the Wodonga maximum temperature in 1968 and the Albury heat waves this summer. See above. So it's the hottest EVER, since 1993. LOL. Yes, it's another angry summer.... but only in the minds of angry activists. Thanks Sou, I have to admit it does appear to be a more intense heatwave this year compared to 1968. I wonder what point that was that EW thinks Sou proved? Presumably that is all just a bit of humorous fun. "We wuz only joking all along. Of course we knew Global Warming was real. Just having a larf." Looks like a bit of positioning for plausible deniability to me. Eric thinks being a troll is good now? Yes, exactly what I was wondering. This isn't the first time WUWT and other fans of Trump applaud Trumps trolling, as if being a troll is a good thing for anyone to be, let alone the US president. And tomorrow Eric will again claim to be a better scientist than actual scientists. The glaciers will be gone before the idiotic denialists finally admit to being wrong. The Orange Monkey was (s)Elected into office in part because of his idiotic stance on climate change, which is flatly stated "was a hoax". That appealed to the low-intelligence crowd (and still does) who helped get this monkey installed into office. But the last laugh is most definitely on them all - the Orange Monkey has shown just how little regard he has for Americans and America's future. He's too busy right now having his glacial meltdown over this stupid wall, acting like a the total imbecile that he is, bringing the entire country closes and closer towards collapse. Big Oil and the Trump Monkey are going to waste America's oil reserves and pollute the skies as fast as they possibly can. Not only does this lead to catastrophic warming, it will cause an enormous financial crash in the United States (the reserves will be depleted 2% - 5% per year, then accelerate quickly). The country this Clown Shirt Monkey is trying to create is called "catastrophe". And his low-intelligence sycophants will cheer him on as long as they can helping him to destroy the country and the world. Good to see you back Sou. thought you loved the heat out near Ipswich eric but you moved to the coast at hervey bay for the milder temps. Goodness no John I moved to Hervey Bay so I could enjoy a last swim at the beach before Antarctica melts next year. Eric, I live on the Sunshine Coast and I swear that the ocean is at least 1/2mm higher than it was last year. I'm very concerned that in a few thousand years, my property might be worthless. Good to see all the pretence of "citizen science" is at an end and you people have admitted to yourselves that all you are good for is trolling. I will just put this here for Skeptikal. Thanks Jammy, but I don't care much for silly risk models... I prefer to live in the real world. No-one cares for silly risk models. It is the sensible risk models you need to care about. I actually hope that these two live beach front. Hold boys and enjoy the ride there may be some turbulence ahead. For those of us not in lala land. A read of the papers collect by ASLR on the arctic sea ice forum is interesting as Judith would say. No, I don't live beach front yet... although a couple of meters of sea level rise would definitely work in my favour. As for why is getting so hard to sell property in NZ.... it's because most kiwis are living over here now. There's not many people left over there to buy any property. Why would anybody think Donald Trump is kidding about a non-believer comment about global warming? He has a multi-year record of science denial. When the IPCC said there's no reversing what we've done we had this marvelous bit of word salad and an attempt to paint himself as being knowledgeable about anything dealing with science because his uncle was. Yeah, that makes sense. To be fair he may be right on that last phrase. There ARE scientists on both sides. Of course the overwhelming number are on one side and a handful of cranks who have been shown to be wrong over and over and over again are on the other BUT technically "you have scientists on both sides of the picture." I always get a kick out of Trumpies who, despite abundant evidence, try desperately to assign some level of cognizance, cleverness, or just having basic knowledge of ... well, just about anything.